UKDN Waterflow > News > Flooding: How Will It Affect My Commute? Flooding: How Will It Affect My Commute? Whilst rain makes the grass grow and the flowers bloom, its effects aren’t quite so kind for the everyday commuter. It gets in your hair and dampens your mood, makes your mascara run and you run late. On a drizzly Monday night, overflowing drains are an overwhelming pain. However, the rain’s role in your ride to work is far more considerable than purely covering the pavement in puddles. For the railway, flooding is one of its greatest risks, destabilising the ballast and sleepers that keep the track affixed in place, triggering landslides that render track impassable beneath debris, and proving deadly to trains’ electric circuits and vital signalling equipment. In 2015, the flood-related devastation of Storm Doris and Storm Eva created an unthinkable £5bn worth of damage, whilst last year’s Storm Angus stranded commuters in London indefinitely, flooding several leading tube stations and causing havoc across the UK. Below, we explore the main causes of flooding in the UK, identify parts of the UK that are most susceptible to flood risk, and chart how flooding has affected UK commuters’ journeys in recent history. There are three principal causes of flooding that often combine, because heavy rain regularly leads to multiple types of flooding at once. i) Overbank flooding – Heavy rainfall can cause the river level to rise over the height of the embankment; this is known as overbank flooding. ii) Flash flooding – Large amounts of water collected at high points and peaks like mountaintops can run suddenly and intensely into floodplains and valleys, overwhelming existing river channels with little to no warning. In coming years, the threat of riverine flooding looks set to exponentially increase: recent research by Drain Trader, citing the Environment Agency’s 2010 report ‘Water for People and the Environment’, anticipates river flow levels in 2050 across the UK to have risen by up to a staggering 15%. Pluvial flooding (also known as ground flooding or ‘ponding’) happens when rain falls with such intensity that the ground, usually serving as a natural sponge, becomes incapable of holding any more water. Instead, water collects on the surface, causing pond-like floods to occur. Pluvial floods also regularly happen in towns and cities; they’re particularly vulnerable to ponding risk due to large expanses of concrete and tarmac prohibiting water from soaking into the earth. 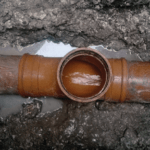 It’s why urban drainage is so important: poorly built systems lack the capacity to manage high volumes of rainfall, causing water to flow onto the surface instead. A little more intuitive than pluvial (ground) and fluvial (riverine) floods, coastal floods arise when vicious storms at sea catalyse sharp increases in the intensity of waves, dramatically extending their height and velocity and enabling them to reach far greater distances than the tide’s usual travel. But what makes the railway susceptible to flood risk? Traditionally, railways were built in low and flat cuttings of land. For flood risk, this proves a double-edged sword: floodwater is able to flow downwardly into the cutting, whilst being naturally incapable of draining out of it. As with any instance of pluvial flooding, the floodwater soaks into the ground until the soil’s retention reaches capacity, whereupon it collects on the surface instead. On Boxing Day 2016 the River Calder overflowed its banks, causing carnage across the town of Calderdale. The Guardian reported that one pub saw floodwater reach ‘well over 6ft deep’, flowing ‘almost as high as the fire exit signs’. Boxing Day meant that many train lines weren’t running, leaving people stranded over Christmas. The ferocious rainfalls of Storm Desmond in late 2015 saw the Lake District’s River Kent overflow its embankment, breaching the region’s antiquated flood defences with ease. Floodwater proceeded to ravage 2,000 of the town’s homes, reaching depths of 5m on Kendal high street and leaving the town’s roads completely impassable. In 2015, phenomenal downpours caused the River Aire to overflow its banks. The floodwater’s devastation – centring around Leeds’ Kirkstall road – severely affected over 3,000 of the city’s businesses and homes and led to cancellations of an enormous volume of trains across West Yorkshire. Throughout history, Nottingham and the low-lying towns of the Trent valley floodplains have been regularly hurt by flood risk. Freak storms in 1947 caused the flooding of thousands of the region’s homes and seventy-eight square miles of farmland. As of 2016, the Nottingham area boasts the most advanced inland flood defences in the whole of the UK, with £45 million of investment going into flood preventative measures in the region. Overbank flooding of the River Thames in February 2014 caused the Environment Agency to issue severe warnings – indicating a ‘danger to life’ – for the majority of towns along the river. Network Rail aired concerns for the safety of five hundred railway stations; this was a staggering rise from the February norm of just fourteen. Fierce storms and rainfall led to flash floods across South Wales in May 2014. Drains filled at break-neck speeds, whilst multiple flooded roads immobilised transport routes after accidents occurred on damaged surfaces. In 2002, freak rains and thunderstorms in the Scottish Lowlands stunned Glasgow’s working class east end, leaving 200 people in need of rescue from their homes. Blame was placed with the area’s nineteenth century drainage system, an antiquarian model that proved completely insufficient for handling the floodwater volume. The flooding caused the closure of Glasgow’s Queen Street station, amidst fears of landslides, and the cancellation of all services along the West Coast Main Line, the main connecting route between Glasgow and Edinburgh. In 2007, surface flooding wreaked over £200 million worth of damage in Hull, damaging over 7,000 homes and 1,500 businesses. The city’s transport links were completely shut down: floodwater forced the closures of many major roads and railway lines and caused the city fire brigade to receive thousands of urgent calls for help. During the last year, London’s rail network has been stunned twice by sudden surface floods. Both Storm Doris and Storm Angus forced the closure of numerous key Underground stations – such as Waterloo, Paddington and King’s Cross – and left thousands of commuters stranded in the capital indefinitely. Monday 28th December 2015 saw the River Ouse rise 5.2m higher than its usual summer level. The floodwater’s effect was magnified by the failure of the River Foss Flood Barrier, which was opened to prevent it from potentially becoming locked in the close position. Over 600 military personnel and 125 mountain rescue members combined with York Rescue Boat teams and volunteers to support the rescue effort and maintain the city’s flood defences. More than forty bridges were damaged by the high waters, severely affecting vehicle access and several railway routes. In 2013, storms out at sea struck Blackpool’s seafront with gale-force winds and flooded its iconic North Pier with 2ft of seawater, causing upwards of 1 million pounds of damage. Recounting the power of the waves, the pier’s manager said: ‘The arcade machines, which take three people to lift them, were being knocked around like toys’. The East Midlands’ famous flatness – epitomised by the Fens – leaves the Lincolnshire coast at severe flood risk. Surging tides – from storm at sea – over Christmas 2013 caused seawater to flood the River Haven by Boston, which in turn led to the river breaking its banks, the town’s drains quickly reaching capacity and more than fifty of its streets becoming submerged by surface floods. Boston’s iconic church – St Botolph’s – sustained over 1 million pounds of damage, whilst over 600 homes flooded. In February 2014, powerful waves quickly overwhelmed seawalls along the Cornish coast, causing devastation in many of the region’s towns, with Fowey, Newlyn, Porthleven and Mevagissey ranking amongst the worst affected. Damage to power sources left over 7,000 homes temporarily in the dark whilst vicious waves destroyed the south coast’s rail-links: high waves dislodged hundreds of tonnes of train line ballast, leading to a 50m stretch of the Riviera Line falling into the sea. Disastrous tidal surges in December 2013 saw 77mph winds and waves a metre higher than usual cause carnage across the coast of North Wales. Local police evacuated huge numbers of homes in Rhyl, as numerous roads were closed and large parts of the town drifted underwater. The freak weather led Virgin Trains to cancel all services between Chester and Holyhead, severing rail connections between England and Wales. Ranking amongst the worst natural disasters in English history, the Great Flood of 1953 displaced over 40,000 people along the east coast. The events saw over 500 people lose their lives in the United Kingdom and its surrounding waters: the passenger ferry the MV Princess Victoria sank in the North Channel east of Belfast with 133 fatalities whilst many fishing boats vanished at sea. With seawater flooding over 160,000 acres of land, damage estimates for the UK ran close to £50 million; in today’s terms, that amounts to almost £1.2 billion. On Sunday the 10th January 1999, the cliffside of Beachy Head plummeted into the sea, taking hundreds of thousands of tonnes of chalk with it. The Environment Agency attributed this to global warming, with heightened waves from rising sea levels chipping away at the cliffside with unprecedented ferocity. Simultaneously, heavy rainfalls saw water seep into the cliffside: the water froze, expanded and then evaporated, leaving large empty holes in the structure that catalysed collapse. In 2012, ferocious rainfall in the north of England and the Scottish highlands immobilised all rail routes between England and Scotland. Freak weather led to dramatic landslides which deposited over forty tonnes of earth on the railway track by Berwick-upon-Tweed, stranding passengers across the UK. Mam Tor: Mam Tor’s name means ‘mother hill’ and derives from the area’s unstable geology, where regular landslides have formed ‘mini-hills’ on the peak’s easterly face. The A625 from Sheffield to Chapel en le Frith used to run along the hillside, but the road collapsed in a landslide in 1979. Hikers can walk along the ruins today! Penarth: In spring 2014, heavy rain in the Welsh town of Penarth caused 150 tonnes of cliffside to fall onto a popular beach. What happened was very similar to Beachy Head: water broke into the rock, froze, expanded and left holes when it evaporated which destroyed the cliff’s support. Watford: In September 2016, on the outskirts of Watford Junction, a train travelling from the Midlands to London Euston derailed after it hit a landslide, forcing the closure of a section of railway that ranks as Europe’s busiest for freight and passenger traffic! Two passengers were treated for injuries, but thankfully neither of the two were considered life-threatening. At the end of the day, it’s essential to ensure that our railway lines are as good at transporting water as they are at transporting people. On the night of the Brexit announcement in 2016 UKDN engineers played a pivotal role in solving issues impacting the Wessex Route at Wimbledon and the Anglia Route at Manor Park. 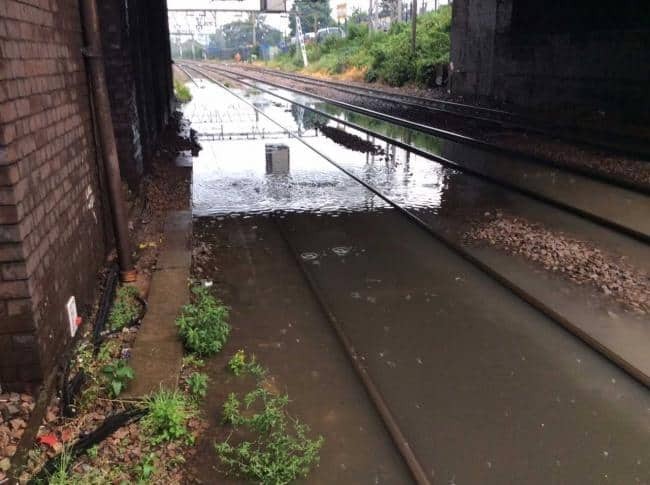 After torrential rain wreaked havoc on commuters, UKDN were called fix the problem. Eamonn Maloney, Network Rail Manager for UDKN, stated that the team of round the clock engineers worked quickly and efficiently to rectify the issue, arriving within 1 hour and 10 minutes from receiving the phone call. For Network Rail, working on their Western Route, we solved key drainage issues at nineteen sites, where excessive water on the line severely limited trains’ mobility. We cleaned catchpits, relayed hundreds of metres of piping, rehabilitated ditching for improved water retention and cleared hundreds of tonnes of rubble, resulting in the removal of the need for speed restrictions and allowing everyone to reach their destinations with greater peace of mind and time to spare! Our online case studies illustrate our rich history of working on many of the nation’s most important sections of railway.